If you’re looking to expand your living area, look up. 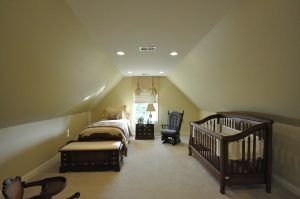 An attic conversion can give you a master bedroom, a private office, or TV room. But before you determine if converting your attic is right for you, or even doable, there may be obstacles. Because local codes vary, a building inspector can provide a list of codes and required inspections for your new attic conversion. Inspectors will take into consideration ceiling codes, joist codes, if rafters can support drywall, lighting, electrical, plumbing, and HVAC system components. They also examine egress codes. Regular bedroom egress codes typically require at least two exits — a doorway and usually a window. An attic bedroom requires both a window and a staircase to the level beneath. The structural framing under your roof will determine if you can add an attic room. Rafters, internal beams extending from the peak of the roof to its eaves, provide a center open space that you can easily remodel. Trusses, W-shaped framing that supports the roof, make it harder to achieve room you want. You might have to cut through, shore up, and alter the very structures that are holding your roof up. If you have trusses, you’ll be better off looking for other areas in your house to expand. Electrical: You will need to determine if your electric panel has room for additional breakers and can handle the increased load of an attic conversion. Plumbing: If you are planning a master suite with a bathroom, it’s a good idea to locate the new bathroom close to the main stack. This reduces the length of pipe you’ll run between sink-shower-toilet drains and the stack, which will cut costs. HVAC: Will your forced air blower move enough air to both heat and cool your attic conversion? If it doesn’t, electric baseboard heating and a window air conditioner may suffice. This is information that the electrician will need to know to determine the total electrical requirements. An attic conversion requires a standard staircase to meet code. Adding a staircase will take up space in a room below the attic, so consider converting a closet. You may be able to regain that storage space by using space under the new staircase. How does a space that reaches sweltering heat in the summer and freezing temperatures in the winter transform to your new living space? Insulation!!! The cost of insulating will also need to be figured into your attic conversion. If you can overcome these obstacles, attic conversions hold tremendous appeal for homeowners seeking more living space under their own roof.